Nothing is more beautiful in the prep world than a nice new pair of Jack Rogers. I've heard plenty of questions about whether or not they're worth the money and if they're comfortable, and let me just go ahead and say for the umpteenth time: they're my favorite shoes. I'm very frugal and didn't want to spend money, but I had found a discounted platinum pair and I never take them off. Here's a link to all my posts related to Jack Rogers! And check out my other post today where my Jacks are featured in my Easter outfit! This is a straight copy and paste from the email Catherine sent me and I was SO grateful for it! After tweeting about the $28 pair I bought, I had so many people text/tweet me about where to buy them, so I just kept forwarding it to all these girls spreading the love. 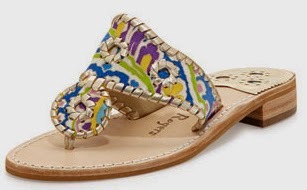 IMPORTANT: The Jack Rogers for this price are only on the Last Call Neiman Marcus website (linked below), so before purchasing your coupon, I would be sure to go through that site and make sure they have the color and size that you want. If not, the Living Social deal is still a great deal and I'm sure you can find other things on the Neiman Marcus site! 1.) This is a Living Social coupon (somewhat similar to Groupon). You're going to pay $25 for a $50 coupon (PLEASE NOTE: there was a promo code "bestmom" that was valid yesterday, but it's expired since then. That code let you get the coupon for $19 instead of $25, so it's only $6 more today. If anyone knows of any other promo codes, please let me know!) by clicking right here. 2.) Then, you'll go to Neiman Marcus's Last Call website and you can search for the Jacks you want here. They had a great selection yesterday, but I'm not so sure about it today because I know some people had problems with not finding their right size! So basically, you now have a $50 gift card to whatever you want, meaning that if you see a pair of Jack Rogers for $59.40, you'll only be paying $9.40 (+ shipping) for the shoes. 3.) Add the pair to your cart and proceed to checkout. After you type your billing/shipping address, there should be a box where you can type your promotion code and Living Social should have emailed you the code for the coupon you just purchased by then. Copy the code from the email they send you and paste it in the box as you're checking out and it should take your total down. I haven't tried buying two of the Living Social coupons, so I'm not sure if you can pay $50 for $100 to get more expensive shoes. I've also searched for promo codes for shipping, so if you're spending more than $75, use the code "FREESHIP". Try using "INCIRCLE" for free shipping as well (but I'm not sure about if this will still work). Good luck, my friends! Tweet me or comment what pair you got! I ended getting a pair for myself and my daughter. The codes didn't work and they did not have a very big selection in the sizes we needed, but 2 pair for under $40 each is still a good deal. Hi Cindi, so sorry the codes didn't work! I didn't realize that the "bestmom" code was only live yesterday and has since expired, so thanks for letting me know! And I guess there were just so many people shopping for them that they ran out quickly, but glad that you both got a pair!